It’s time to refresh your home’s eating area with this side chair from the Atrium collection. 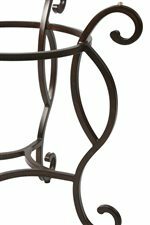 Crafted from heavy duty 16-gauge steel, this chair is built to withstand the tests of time. 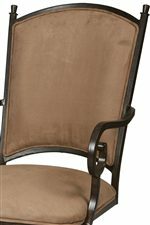 To keep you completely comfortable while you converse with friends and family, the side chair offers an upholstered cushion seat in Topanga Brown fabric. With a mixture of sleek and gently curved lines, plus an eye-catching crisscross weave pattern on the chair back, you’re sure to love the fashion and function this chair will bring to your home. The Atrium Metal Dining Side Chair with Topanga Brown Fabric by Pastel Minson at AHFA in the area. Product availability may vary. Contact us for the most current availability on this product. Finish Manufacturer utilizes a 5-stage powder coat system, which offers better protection for a more durable finish. Metal in this collection is finished in Autumn Rust. 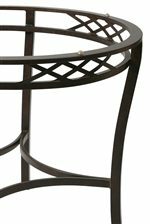 The Atrium collection is a great option if you are looking for Cottage furniture in the area.